Charlotte Mather raised over £1000 for Missing People by selling second-hand clothes at the Henley Traditional Boat Show. She first heard of the charity after hearing Peter Boxell talk about the Big Tweet for Missing Children on BBC Radio 4. 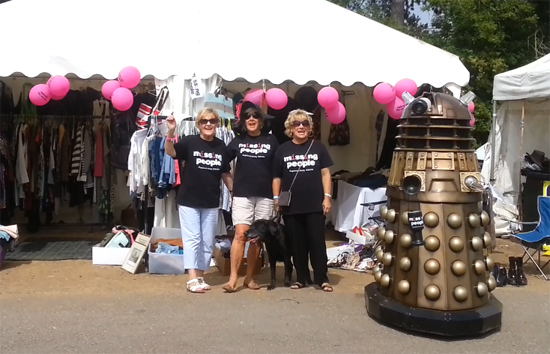 "Two weeks ago I found myself leading a team of helpers in the searing heat, selling second-hand clothes at The Traditional Boat Show in Henley. Why? Because I was blown away by a radio broadcast about the work of Missing People. For the last seven years I have raised money for a children’s organisation in Thailand. I spent my early years in the Far East and was particularly drawn to the area and have visited and worked at the organisation as a volunteer many times. Whilst there, I encountered and learned some of the terrors and horrors of child trafficking. I had not heard of Missing People until I heard the radio broadcast this year. I was so motivated by what I heard that I resolved to do something for them, and above all to try to stop vulnerable missing children being picked up by the wrong people. It’s not that difficult to raise money; you just need good friends, some energy and a healthy sense of humour. If anybody else wants to have a go, here are my top tips and advice. First, you’ll drive all your friends crazy by asking them for their unwanted clothes. Then you ask them to ask their friends for theirs. Thank God for emails! I collected shoes, men’s shirts, jewellery, and women’s clothes. Suddenly I was getting calls; everybody was turning out their wardrobes! You need somewhere to store the clothes and about three months to collect everything. Be careful to throw out anything stained or worn, as prospective buyers can spot a stain at 300 yards. My flat has looked like Mrs Tiggy-winkle’s for the last few weeks, with shirts and dresses drying everywhere. Of course you must sort out a venue, preferably with as much footfall as possible. There are lots of fetes in the summer, which are ideal. Everybody loves a bargain. Most of the items I sold went for under £10. I sold men’s shirts for £3, but they are quite hard work as you have to wash and iron them. I was really surprised at the quality of dresses people donated. Most of them were pleased that an outfit they have worn once for a wedding was going to good use. Each time I run a sale I learn something new. I shan’t be doing shoes again as they just don’t sell, but dresses and tops and shirts fly off the rails! A very important ingredient is long suffering friends who like fashion. I haven’t a clue about labels but my friends put me right. We were selling clothes at the Trad Boat Show over three days in the glorious sunshine and I had a different group of helpers each day. Each day I brought in some gin, and tonics and lemon, and we get stuck in about an hour and a half before closing time. It makes for a very merry evening! My girls absolutely adored their time selling and have begged me to ask them again! There is something terribly satisfying about selling especially if you have never been in the trade. I was chuffed to bits with my selling prowess. Surprisingly some of my girlfriends’ husbands got stuck in too. Once a sales man always a sales man, even if you are now a captain of industry! One friend who has a well-known impresario husband said he absolutely adored flogging shirts and it took him back to his early days when he had been a market trader. So there you go! I managed to raise over a thousand pounds over the three days and everyone had a fun time. It amuses me to see my dresses being worn around Henley by complete strangers, and I’m pleased to have raised so much for Missing People. A win-win situation, don’t you think?" 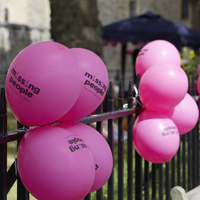 If you're interested in fundraising for Missing People, we would love to hear from you! Click here to email the Supporters Team.